Aimed at the preservation of nature's wildlife treasures, the CITES regulations was formulated and, by international agreement, became one on the cornerstones of wildlife conservation worldwide. It regulates trade of endangered species and stipulates which animals should be considered as very rare animals, those in danger of becoming extinct. CITES aims to preserve indigenous fauna and flora by regulating exports, imports and trade of game, trophies, or specimens of wildlife (which includes all types and parts of plant specimens as well). Only through agreement and after conditions have been met, the CITES system of permits and certificates yields those consignments that legally are to be shipped or flown to other countries. CITES enforces the use of scientific - and management authorities which have the right to issue these certificates and licenses. To prevent unauthorized trading even more strictly, even re-exporting permits can't be issued unless the authorities can trace down the path that the specimens came into the country. Only if it was done according to the CITES regulations, a re-exporting permit will be issued. The species named under the second Appendix are species that isn't endangered right now, may become on the danger list if steps aren't taken to prevent it. It also specified regulations concerning species that isn't endangered at all, but have a strong similarity to other species that is and may easily be confused with one another. For transport of the species listed under this heading, one first needs proof that the product or specimen was obtained in accordance to the ordinances of the Nature Conservation Law, after which an export or re-export permit may be obtained. After that, an import permit can be issued. The re-exporting permit isn't issued, unless proof can be given that the CITES provisions have been met. The species listed under the third Appendix concerns species that are restricted because of concern of their numbers by a certain Party (usually because of low numbers in a certain area). The co-operation of other Parties, however, are needed, in order to prevent misconduct in the jurisdiction of the first Party. The same restrictions as was mentioned under the second Appendix listing will, in such instances, be followed. This schedule 1 animals (Appendix 1)need a special import permit from the hunter/conservationist's country and should be obtained before the he sets of on his (in such instances) very ambitious safari. The issue of permits depends upon the answering of questions about trading, and the type of trade in the species involved. The impact of hunting or capturing animals to the survival strategy of listed animals will be important. In case of shipment of live animals, the standard of the shipping operation will be evaluated. The process of the acquisition of specimens will usually be traced. Questions about, and proof of the necessary facilities on the importing side will be asked and needed. Details about the care and future of live stock will be asked. Imports of Appendix 1 specimen's will usually only be allowed if it could enhance the survival strategies of that specimen. Commercial benefits to the importer doesn't weigh much in this regard and are forbidden by the CITES Convention. These listings may change from time to time and it is strongly recommended to have this information updated with both their Professional Hunter and Outfitter, as with wildlife authorities in their own countries, before the planned safari's take off. This may be the single most important reason why a hunter may loose a prized trophy : failure to obtain the specified special permit prior to the hunt. Hunters thus both needs the import permit or license of his own country and the export permit from the country where the animal will be hunted. It may be quite legal to hunt a certain animal in South Africa (as, for instance, the leopard). But, as in the case with some countries, it may just as much be prohibited to have this trophy imported into the hunter's country of citizenship. CITES also distinguishes schedule 2 (Appendix 2) animals that aren't endangered, but are threatened nonetheless. Although permits for the hunting of these animals may be granted more freely, the hunter in the end still have to obtain both an export permit from the hunting ground's country, as well as an import license from his own country. 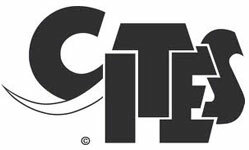 The CITES 1 and 2 listing is, naturally, much longer and it may be worth while to approach the authorities to obtain the youngest listing.